I fortunately found this original handbill which happened to be folded up at the back of a recently acquired second-hand book, dating from about the same period. I’d guess it had lain there – forgotten about – all this time. I thought it might be of interest to My Brighton & Hove readers. Anyone wishing to add information to that given in the document is welcome to contribute. Maybe some personal words from a relative of Mr. Hussey? How did his work in the Labour Movement develop from here? Was he the Thomas Hussey of 74, The Avenue, Moulsecoomb (Pike’s, 1939-’40)? Is anyone able to give some valuable background to the circumstances of the 1935 Council Bye-Election? 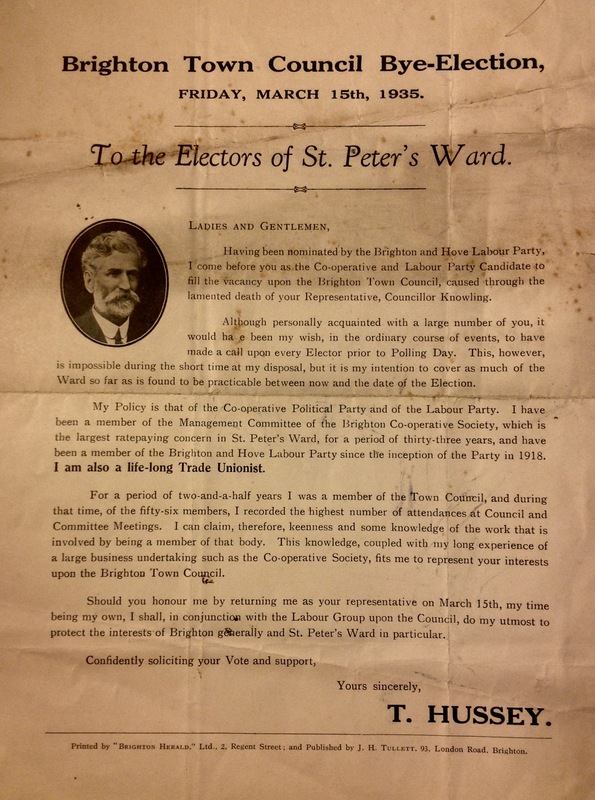 I haven’t yet found the results for St. Peter’s Ward in that year! … And can anyone speak about Councillor Knowling?